There was barely one week left before the Perth Fair and the level of activity in our Mother’s kitchen made the average factory look like it was shut down for lunch. 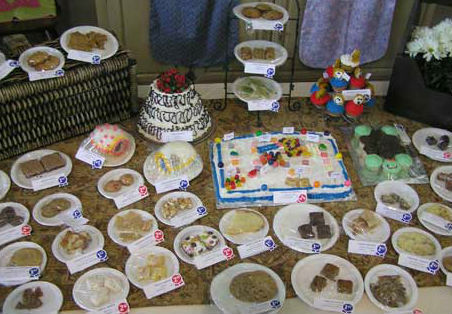 She was doing test-runs on many of her baked goods that she had included on her entry form. There were ‘test’ pies and ‘test’ cakes and ‘test’ loaves stretching from one end of the kitchen to the other. Her metal cooling racks on top of the old chest freezer were operating like a conveyor belt as she moved the cooled baking from a rack and set another item fresh from the oven in its place. Mother was keeping a watchful eye on her garden as well, because she was also entering some vegetables as well as cut flowers. She’d do an inspection of the gardens once, sometimes even twice daily to check for pests or to see which of her crops would be good enough to compete. She watered her flowers carefully and hoped that there wouldn’t be a downpour anytime before next Friday so that none of the leaves or petals would be damaged. As if she wasn’t busy enough with her baking and gardening she also had sewing and ‘fancy’ work that she was preparing. She almost always entered one of her afghans in the Fair and would be examining it closely to make sure that the edges and any joints were stitched flawlessly and that her crocheting was up to snuff. She usually entered a knitted baby sweater set as well and would be busy cutting a cardboard backing and pinning the tiny sweater, bonnet and booties so they would look lovely on display. Just when you thought that she couldn’t possibly be entering anything else in the Fair she would clear off the top of the dining room table and place a large piece of white bristol board down on the surface. She had a stack of photos that she was entering in the photography competition and she was arranging them carefully and sticking the little gold corners down to hold them in place. Next, came the labels placed neatly under each photo and of course the fair tag filled out and folded, attached with a piece of white string. So this was our home the last week of August, every year was the same. There were lots of home baking and displays of well shaped vegetables. There were flowers arranged in different vases for each of the categories. Sewing, knitting and crocheting was stacked and ready to be transported into town. Photographs would be mounted and displayed according to the different themes. As the hot summer weather wound down for the season, our house was winding up like a well oiled machine the last week of August. There was no possibility that anyone in the house wasn’t well aware that the Perth Fair was only days away. There was an incredible sense of anticipation and excitement building as we all counted down to the most exciting event of the year. Mother looked forward to the Fair all year and her enthusiasm was contagious. In less than a week we would be riding the ferris wheel and seeing the bright lights, sights and sounds of the fair grounds. There would be cotton candy and candy apples and lots of things to see and do. At the center of it all would be our Mother seeing old friends, winning lots of prizes and most of all enjoying the fruits of her labour. ← See You at the Perth Fair Saturday, September 1st!